Snowmobile Show season is coming to an end in North America just as Winter is nicely beginning to introduce itself (a light dusting of snow is on the ground outside my window as I write this). For as long as I can remember, hitting the closest autumn snow show was central to the yearly snowmobile experience. 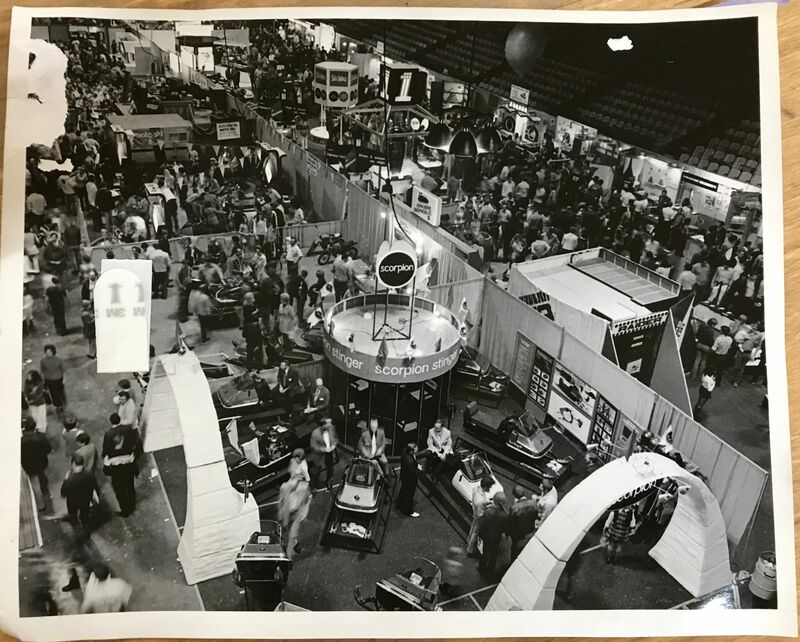 It was THE place to grab trail maps, brochures of cabins and resorts that catered to sledders, as well as catalogs from every company doing business in the sport. Way back in the olden days, pre-Interwebz, snow shows were pretty much the only way to see and digest a wide array of info about snowmobiling. As such, it fueled the anticipation for the upcoming riding season in a way that seems quaint by today's standards, what with the instantaneous access to every video, picture and informational tidbits that are just a few clicks and taps away. 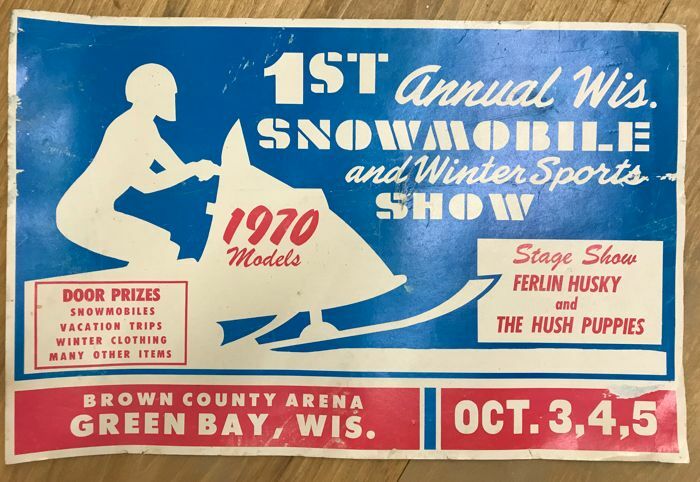 Recently I ran across a few photos of one of the early first-ever Wisconsin Snowmobile Show while perusing some of the historical artifacts at the Snowmobile Hall of Fame in St. Germain, Wis.
As the poster shows, the first show was held at the Brown County Arena in Green Bay in October of 1969, it offered sledders (and those who aspired to be) a chance to see and touch the 1970 model lines of a bunch of brands. 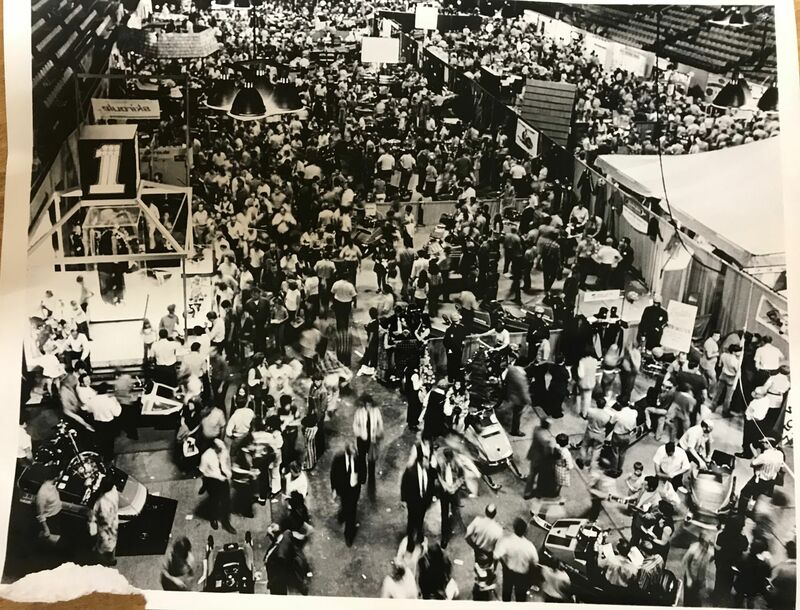 Judging from the black and white photos of the subsequent 1972 show, A LOT of people showed up those early years. And many were decked out NOT in neon FXR onsies, but rather in the same suits and dresses they wore to Sunday church service. It was a different time for sure, but I gotta believe those men, women and children got the exact same charge out of seeing all that sled candy that we do now when cruising social media, Webz and magazines (not to mention the many snow shows and events that still exist today). Enjoy the pix. If you want to see larger images, right-click and save the pix (I sized them larger than most of the images I host on the servers). Our family went to this show, I believe for the '72 to '74 model years. As a kid this was the greatest thing ever. We ran around filling a bag (Quaker State Snowmobile Oil) with stickers and brochures from every snowmobile brand, oil company, spark plug manufacturer, etc. etc. An arm's length of "The Cat was here" stickers was always a favorite. Also got to see the Boss Cat on display. I still have the brochures from all of those obscure snowmobile brands. I am a big Ferlin Husky fan..
Back in the day you sure had a lot of different snowmobiles to look at. It looks like around the 1973-74 year. Back in the Twin Cites they had a show around 1970 where one snowmobile company had girls in high boots and hot pants. Everyone was around checking their booth out. It wasn't a major snowmobile maker. 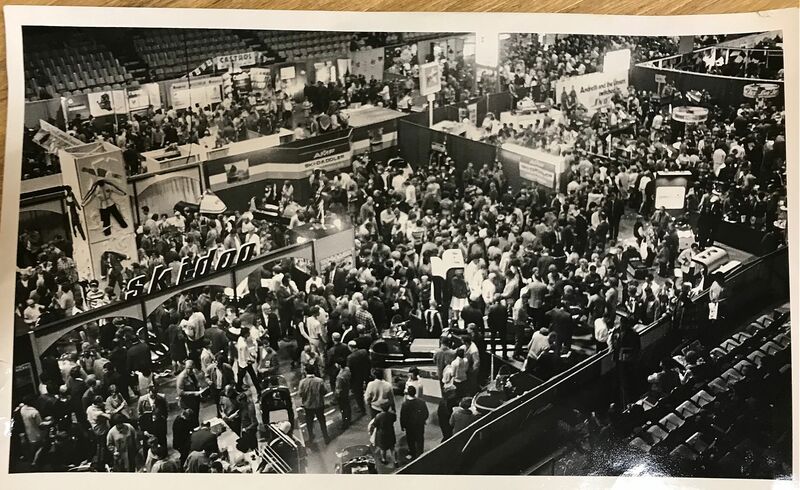 Pictures shown are for 1973 model year, as first Scorpion snowmobile booth has sleds with air scoops and as a owner of 72 model there were none , and some were prone to overheating problems. Our first sled was 1969 Scorpion Mark II , and have since 1990 been on Cats... Again great reading and stories! Hey any way you could somehow put the pics on a link so we could blow them up and see what's there? I could look at this cool old stuff for hours. Thanks! Thanks John for the great pictures and memories. So many different sleds back then. To bad it's still not like this. Miss those days. gbarchives67-72. Steps to see photos larger. These instructions are for a computer. 1. Right click on photo and select "Save picture as". Click "Save". You can rename the file or just use the one it shows. 2. Choose the location you wish to save the file to. I usually select the Desktop but you can choose any location you want. 3. Go to the location you saved the file to. 4. Double click on the picture file or you can right click on it and choose the "Open" or "Open with". With "Open with" you can choose which photo viewer you want. 5. Your default photo viewer should open the file. You can then use the zoom feature to move around and see more. There are many local snowmobile shows, too. I recall dealers in my area setting up a show in the ballroom of a supper club in Green Lake, Wis., that was jam-packed. I vividly remember getting a close look at the 1972 EXT and 1972 Blizzard races sleds at that show.